* See muskrat trapping for information on trapping muskrat after the general trapping season in areas where the beaver season is open. 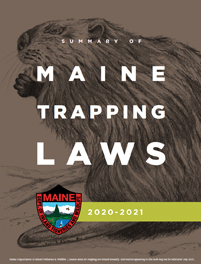 If you are trapping in southern Maine, IFW would like to know if you accidentally trap or see New England cottontail rabbits. Cottontail rabbits are smaller than snowshoe hare, have hind feet less than 4 inches in length, and do not turn white in the winter. Their coat remains brown all year round. Please let us know about any rabbits you see. This is Maine's only native rabbit and IFW is actively trying to restore its population. Identifying new areas where the rabbit occurs could greatly benefit restoration efforts. If you accidentally capture a cottontail rabbit, please contact a biologist in your region or Wally Jakubas at walter.jakubas@maine.gov or (207) 941-4471. A list of nuisance beaver sites may be available for your area. Please contact your regional wildlife office if you are interested in the location of recent nuisance beaver removal sites or the location of any current nuisance sites. Please remember that a temporary tag must be signed, dated, and attached to captured marten or fisher at the time the animal is removed from the capture site. Fur tagging agents are to retain the temporary tag from each marten or fisher after they attach the permanent fur tag to the pelt. If you catch a collared or ear-tagged animal in one of your traps, that is NOT a lynx, you may take the animal for fur. However, you will need to return the collar and tags, and we would appreciate knowing where you caught the animal. Please call the nearest regional MDIFW office to report the location of the catch to a wildlife biologist and arrange to return the radio collar and tags. The Department mails trapping information to all trappers each fall. Please contact the Department (207-287-8000) if your contact information has changed or you no longer plan to trap. License holders can contact the Department to receive the temporary marten and fisher tags.